Imagine being an archaeologist on a dig – I’d love to be one – scraping away at the earth day after day. You might find a little clay pot or the odd earring every now and then. Apart from that, days are probably pretty uneventful but all the time you’d be secretly hoping for the big find; the one that’s going to hit the headlines. If you read this blog a lot, you’ll know that Tlos is one of our favourite archaeological sites with its mixture of Roman ruins and Lycian rock tombs – so we were really interested when we found out some time ago that a team of archaeologists would begin another dig there. We’ve made it up there a couple of times recently and each time, a little more of the Roman past has been uncovered – great to see more and more being gradually revealed. I wonder which archaeologist it was that was scraping the earth and then hit something hard. Scraped a bit more…and a bit more…marble reveals itself…bingo! Statues of the Roman Emperor Hadrian, emperor Antoninus Pius and his daughter, Faistinaminor, the goddess Isis and it says Marcus Aurellus but we think this may be a misprint. We’re wondering if it should say Marcus Aurelius as all these men were contemporaries and their statues always look similar. We assumed the statues would be whisked away to Istanbul, Ankara or at best, Antalya Archaeological Museum – but, thanks to Twitter, we saw one of the Turkish language newspapers had reported the statues had been taken to Fethiye Museum. Often overlooked by visitors to Fethiye, the museum finally has in its possession a bit of a draw in the recently discovered statues. We went up there yesterday to see if we could see them, expecting them to be packed away somewhere, not for public viewing just yet. But, maybe we got there at the perfect time and the museum hasn’t decided what to do with the statues yet because there they were, greeting us at the gate. How the archaeologists managed to identify the statue on the right is beyond us being that she has no face. Maybe there are clues in the clothing she’s wearing. Whatever the case, these are the two female statues – and one of them is a goddess. As for the males. I’ve looked online at various sites, including the British Museum website, to try and identify which is which – and I’ve got to say, they all look very similar. We’ll have to wait till the staff at Fethiye Museum mount them and label them. If it was a misprint in the newspaper and the third statue is Marcus Aurelius, we’re guessing this is him as he was younger than Hadrian and Antoninus. Is this the statue of Emperor Hadrian? Curly hair and beards were in fashion at the time and so all three of these important people have curly hair and beards – not good for an amateur identifier of Roman statues! So that must mean that this is Antoninus Pius – his face is slimmer than that of Emperor Hadrian and that’s the only reasoning I can provide. We were lucky to be able to get photos of these fantastic finds from Tlos. If Fethiye Museum chooses to move them indoors for display, cameras are not allowed to be used inside. So, if you’re in the area and you’re interested in archaeological discoveries – and taking photographs of them – get yourself to Fethiye Museum. 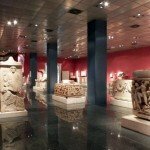 Antalya Museum – Our Favourite Museum In Turkey? HOw interesting – the similarity is amazing. @ Italian Notes: Which makes for very difficult identification. There must be other ways that the archaeologists have of identifying one from the other . Very cool! It’s amazing to think how many antiquities probably are still buried underneath the Turkish landscape. That is so cool!! And even more cool that you got to see the statues up close and outside before they make their way into the museum setting. It will be interesting to see who they finally identify them as. Very nice, I would love to participate to excavations, it’s so exciting. They constantly do it in Italy, I might join some one day. @ Joy: I know, there must be allsorts waiting to be discovered all over the country. @ Angela: Yeah, it would be great to join in on a dig wouldn’t it. Imagine if you found something, too. Don’t know about the other two but the male at the top would appear to be Russell Crowe, albeit a version that has been brought up on Imam Bayıldı rather than Power Shakes. I’m quite tickled by they were they are standing around by the gate, like they also visitors and are waiting for the museum to open to see what’s been going on since they were buried.